8 p.m., Room T.1.19, Tara Building, Mary Immaculate College. For people of a generation younger than me, the words ‘Goth’ and ‘Gothic’ conjured up images of teenagers in flowing black clothes and whitened faces. For some of you, these words may make you think of the novels of Bram Stoker or Sheridan Le Fanu. So, if you were hoping to hear about either topic under the heading of ‘Gothic Revival’ this evening, you are in the wrong room. The ‘Gothic Revival’ in architecture was well under way when Augustus Welby Northmore Pugin began his practice. Indeed, there architects working in the Gothic style in Co Limerick and the neighbouring counties at an early stage, including, most notably, members of the Pain and Fogerty families. But Pugin is such a giant on the architectural landscape of Ireland that I think he is worth introducing this evening, albeit with the understanding that he left very few footprints in Co Limerick, and, even then, these are difficult to identify with certainty. I have spent some time over the past decade travelling around Ireland, mapping and cataloguing Pugin’s contribution to Ireland’s architecture and landscape. This exercise has led to similar traipses throughout the English Midlands. My great-grandfather, James Comerford (1817-1902), and his brothers, Richard and Robert Comerford from Newtownbarry (Bunclody), Co Wexford, worked throughout Co Wexford with Richard Pierce (1801-1854), the Wexford-born architect used by Pugin to oversee many of his building projects – most notably his work at Saint Peter’s College, Wexford, and his cathedrals in Killarney and Enniscorthy. Michael Fisher, an authority on Pugin’s work in Staffordshire, has referred to Staffordshire as ‘Pugin-Land.’ In many ways that epithet could also be applied to Co Wexford. Pugin’s death in 1852, followed by Pierce’s death in 1854, explain James Comerford’s decision to move to Dublin in the early 1850s. The family’s traditional links with this architectural cluster continued when James’s own children married into the Coleman and Cullen families, who also worked with Pugin and his architectural heirs. So, my interest in Pugin is as much a tribute to my own great-grandfather and his children as it is to the greatest figure in the Gothic revival. We are all aware of the Gothic revival. Ask any child to sketch a church and she is more than likely to draw a church with a tower and steeple and three pointed windows. The more creative child might even add a porch. But no child in Limerick is going to draw a church with a classical façade, complete with columns and triangular pediment, still less is she likely to draw a white-washed Byzantine church with a blue dome. The Gothic revival has influenced and shaped how every one of us sees and sets our standards of what a church should look like. 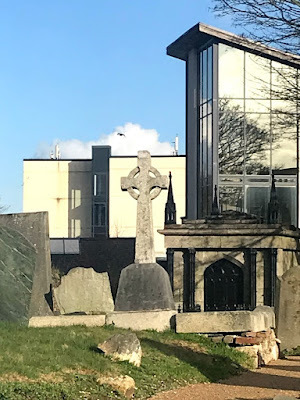 The Gothic Revival long-predated Pugin, the Pain brothers and the Fogerty family in Limerick, or the arrival of Philip Hardwicke at Adare Manor. It began as an architectural movement in the late 1740s in England. Its popularity grew rapidly in the early 19th century, when increasingly serious and learned admirers of neo-Gothic styles sought to revive mediaeval Gothic architecture, in contrast to the neoclassical styles that had come prevalent at the time. Gothic Revival draws features from the original Gothic style, including decorative patterns, finials, lancet windows, hood moulds and label stops. The Gothic Revival movement that emerged in 18th-century England, gained ground in the 19th century. Its roots were intertwined with deeply philosophical movements associated with Catholicism and the Oxford Movement and a re-awakening of High Church or Anglo-Catholic tradition among Anglicans. By the third quarter of the 19th century, the Gothic revival was appealing to all Christian traditions on these islands and in many other places too. The difference between Pugin and his predecessors in the Gothic Revival movement is the intensity of his ideology, and the way he gave expression to this in a short life span of only 40 years. Even though Newman preferred the Byzantine style for churches and dismissed Gothic as pagan, Pugin is the architectural voice and vision, the architectural visionary and ideologue, of those in the Oxford Movement who moved over to Rome in the 1840s and 1850s. Rosemary Hill has described him as ‘God’s architect’ … and if John Ruskin could describe architecture as poetry in stone, then Pugin’s work is theology in stone. Augustus Welby Northmore Pugin (1812-1852) was an architect, designer, artist, and critic who is principally remembered for his pioneering role in the Gothic Revival style of architecture. His work culminated in designing the interior of the Palace of Westminster and its clock tower, later renamed the Elizabeth Tower, which houses the bell we know as Big Ben. He also created Alton Castle and Alton Towers in Alton, Staffordshire. Pugin designed many churches in England, including Saint Giles’ Church, Cheadle, and Saint Chad’s Cathedral, Birmingham, and many churches in Ireland and Australia. He was born on 1 March 1812 at his parents’ home in Bloomsbury, London. His father, August Charles Pugin, was a French draughtsman who had emigrated to England at the time of the French Revolution. Like many other French émigrés at the time, he probably joined the Church of England to guarantee government commissions and tenders. Between 1821 and 1838, he published a series of volumes of architectural drawings, Specimens of Gothic Architecture and Examples of Gothic Architecture, that became standard reference works for Gothic architecture for many decades. His mother, Catherine Welby, was from the Welby family of Denton, Lincolnshire, and the Pugin family lived in Bloomsbury. As a child, his mother took Pugin to the Sunday services of the fashionable Scottish Presbyterian preacher Edward Irving (1792-1834), later the founder of the Holy Catholic Apostolic Church or ‘Irvingites,’ at his chapel in Cross Street, Hatton Garden. Pugin learned drawing from his father, and for a while went to school at Christ’s Hospital. After leaving school he worked in his father’s office, and father and son visited France together in 1825 and 1827. His first independent commissions were for designs for the royal goldsmiths Rundell and Bridge, and for designs for furniture in Windsor Castle. At this early stage, he was also designing theatrical sets and scenery. He then established a business supplying historically accurate, carved wood and stone detailing for the increasing number of buildings being built in the Gothic Revival style, but this enterprise quickly failed. In 1831, at the age of 19, Pugin married the first of his three wives, Anne Garnet. Anne died a few months later in childbirth, leaving him a daughter. In 1833, he married his second wife Louisa Button, and they were the parents of a further six children, including the architect Edward Welby Pugin. Louisa died in 1844, and in 1848 he married his third wife, Jane Knill, and their son was the architect Peter Paul Pugin. Meanwhile, Pugin had converted to Roman Catholicism, and he was received into the Roman Catholic Church that year. To put this into context, it was just six years after Catholic Emancipation or the passing of the Roman Catholic Relief Act of 1829. Later, he would accuse Barry of stealing the best of his plans and ideas. But Pugin could always come across as arrogant when it came to criticising his contemporaries. To his advantage, Pugin’s new church membership also brought an introduction to John Talbot, 16th Earl of Shrewsbury, a Roman Catholic peer who was sympathetic to his aesthetic theory. His wife, Maria Theresa Talbot, was a daughter of William Talbot of Blackwater, Co Wexford, and she was a niece of John Hyacinth Talbot (1794-1868), MP for Wexford – in other words, Lord Shrewsbury was related by marriage to the Talbot and Redmond families, two of the most powerful political families in Co Wexford for much of the 19th and early 20th century, including John Redmond. Shrewsbury employed Pugin to rebuild his family home at Alton Towers in Staffordshire, and to build Saint Giles Roman Catholic Church in nearby Cheadle. When Pugin’s second wife Louisa died in 1844, she was buried at Saint Chad’s Cathedral, Birmingham, which Pugin had designed. Meanwhile, Pugin had found Salisbury an inconvenient base for his growing architectural practice. He sold St Marie’s Grange and bought a parcel of land at Ramsgate in Kent, where he built himself a large house and, at his own expense, a church dedicated to Saint Augustine. In February 1852, while travelling by train with his son Edward, Pugin suffered a total breakdown and arrived in London unable to recognise anyone or speak coherently. For four months he was confined to a private asylum, Kensington House, before being moved to the Royal Bethlem Hospital, or ‘Bedlam,’ then close to Saint George’s Cathedral, Southwark, one of his major buildings and where he had married his third wife Jane in 1848. Jane Pugin and a doctor moved Pugin from Bedlam to a house in Hammersmith where he recovered sufficiently to recognise her. In September, she took him back to the Grange in Ramsgate; there he died on 14 September 1852. He was only 40. He is buried in Saint Augustine’s, his church next to the Grange Ramsgate. 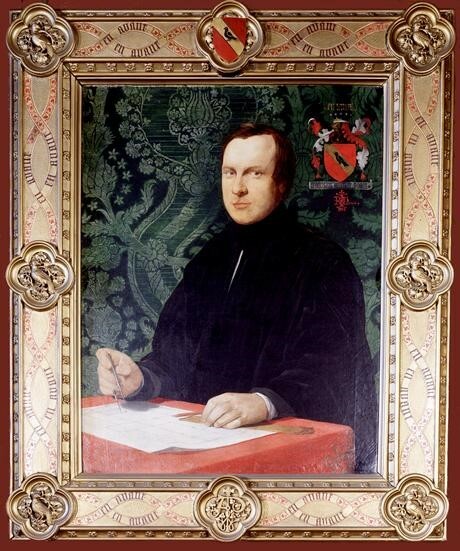 The cause of death was listed as ‘convulsions followed by coma.’ Pugin’s biographer Rosemary Hill suggests he was suffering from hyperthyroidism but points out that his medical history suggests he had syphilis from his late teens. 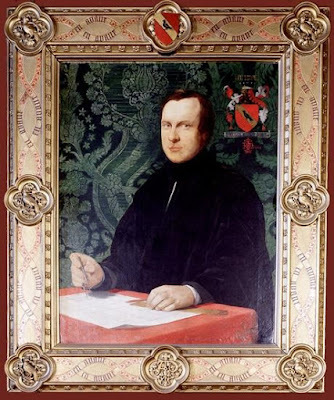 The Talbot family connection provides the key to Pugin’s commissions throughout Ireland. This entrée was provided by John Hyacinth Talbot, MP, of Castle Talbot and Talbot Hall, Co Wexford, an uncle of Maria Theresa Talbot, Countess of Shrewsbury. Although Pugin only visited Ireland about 10 times in all and never spent longer than 12 days in Ireland, from the late 1830s until his early death in 1852, he designed a large number of Irish churches and convents, as well as the great seminary at Saint Patrick’s College, Maynooth, Co Kildare. He had a romantic and idealised view of Catholicism, so he was challenged and indeed uncomfortable with the reality of a highly politicised church in Ireland and its social context and makeup. Circumstances meant he left the close personal supervision of his building projects in the hands of trusted Irish architects, particularly Richard Pierce, and many of his projects were not be completed in his lifetime because of lack of funds and because of the consequences of the Famine. After Pugin’s death in 1852, work on his unfinished Irish commissions was carried on by his son Edward Welby Pugin, by John Joseph McCarthy, and, for the two years before his own death, by Richard Pierce. 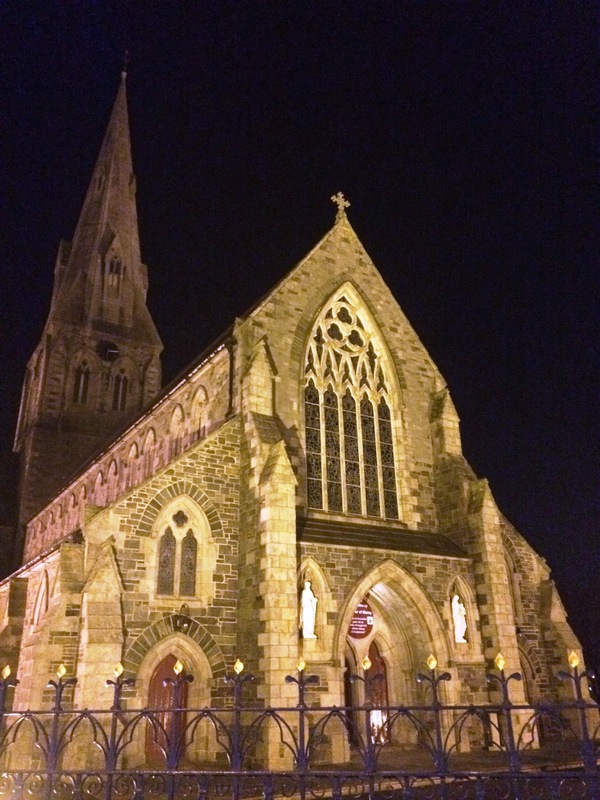 Pugin was the chief designer for the Birmingham church decorators John Hardman & Co. His involvement in Irish church building and decoration gave rise to the establishment of a Dublin branch of the firm in 1853, under the direction of Thomas Earley and Henry Powell. Samuel Lewis says in 1839 that the ‘very fine tower and spire’ was ‘lately added’ to the Roman Catholic Church, Tullow, Co Carlow. The church is attributed to Pugin by Thomas Kennedy in his History of Irish Catholicism (1970, vol 5, p 35), and this is noted in the Dictionary of Irish Architects, but not by Rosemary Hill or any of Pugin’s other authoritative biographers. This church, the first of Pugin’s Irish churches, was commissioned by John Hyacinth Talbot MP. The church was built by Canon Philip Devereux, thanks to the generosity of the Talbot and Power families, on land given by Colonel Henry Alcock of nearby Wilton Castle in 1837. John Hyacinth Talbot ‘procured’ the plans from Pugin, and – if we date the church to the laying of the foundation stone in 1837 – then this is the first of Pugin’s Irish churches, although he never actually acknowledged the church as his own. The foundation stone of the Church of the Assumption, Bree, was laid in 1837 and the church was completed in 1840. As an early church, it is a simple building with a long nave and smaller chancel. The main feature, which is now concealed, was a very early example of open-roof timbering. The church has been much changed in recent renovations, but it is an interesting church in the light of Pugin’s other Irish churches built in the years that followed. It also owes its existence to the Redmond family patronage. Pugin’s first great work in Ireland is the Chapel at Saint Peter’s College, Wexford. He laid the foundation stone for the chapel on 18 June 1838, the chapel was dedicated on 15 June 1840, and the first Mass was celebrated in the chapel that year. The collegiate style of the chapel was unique in its day. The chapel interior remained unchanged until 1950, when the rood screen was removed, changing Pugin’s original design. What survives is the fine triptych altar design and the magnificent Hardman stained glass in the rose window, which contains the Talbot family coat of arms. It is still an original and beautiful interior where. Saint James’s in Ramsgrange was built as a new church for Father George Murphy. The plans are said to have been copied from chapel at Saint Peter’s College, Wexford. JJ McCarthy claimed in 1856 that he had been told that Pugin was ‘very angry when he was informed that his design for Saint Peter’s College Chapel in Wexford was copied as a parish church in Ramsgrange.’ The church tower was added in 1870. But, whatever Pugin contributed to the design of this church is largely masked by later additions and alterations. Pugin’s church in Gorey, Co Wexford, is unique among his Irish churches for it is built in the Norman style. It was begun in 1839, was completed in 1842, and is one of his earliest Irish commissions. The patrons were the Esmonde family, who donated the site and whose coat of arms are displayed above the front entrance. The spire was never added, but Pugin shows it in his drawing of his churches. The interior was also decorated with highly coloured stencilling and his hand is seen in the timbering of the roof trusses. This convent, next to Saint Michael’s Church, Gorey, Co Wexford, was also designed by Pugin in 1839, but may have been built later. Pugin produced his designs Loreto Abbey, Rathfarnham, Co Dublin in 1839. His drawings for the church were prepared at the same time as his plans for Saint Michael’s Church, Gorey, Co Wexford, and Saint Chad’s Cathedral, Birmingham. They all date from 1839, and together they mark the end of the first phase of his career. His drawings were completed by 28 May 1839. In parts of the chapel, Pugin’s designs were inspired by the Octagon or Lantern Tower in Ely Cathedral. However, the building was simplified in execution by John Benjamin Keane working with Patrick Byrne. The angels on either side of altar by the sculptor John Hogan are believed to be based on Hogan’s two eldest daughters. This convent and school were designed by Pugin in 1842. It now serves as a health centre. Pugin was present when the foundation stone was laid on 10 June 1842. The main contractor was Richard Pierce, the Wexford architect Pugin employed for most of his work in Ireland. However, it took over two decades to complete Pugin’s chapel, and when it was consecrated by Bishop Dominic O’Brien in 1863, it was more than ten years since both Pugin and Pierce had died. The Presentation Order sold the building in 2006 and it is now a health centre. Saint John’s Manor, a manor house in Waterford, was rebuilt ca1845 for Sir Thomas Wyse, a friend of Pugin. But Pugin considered Wyse’s expectations too elaborate for a house of this side, and we are unclear what was actually designed by Pugin. Saint Mary’s Church, later Saint Mary’s Cathedral, Killarney, Co Kerry, was designed by Pugin as miniature, two-thirds size replica of Salisbury Cathedral, and was built in 1842-1850. Here Pugin’s patron was the Earl of Kenmare, and the work was overseen by Richard Pierce, the Wexford architect who oversaw much of his Pugin’s work. It is disappointing to notice that the plaque outside the cathedral declares it is the work of Edward Pugin and not of his father Pugin. Adrian Hilliard has helped me to identify Woodford House, Killarney, as one of the few examples of domestic architecture by AWN Pugin in Ireland. When I visited, Mary O’Connell was very welcoming as she pointed out how an earlier house, built in the 18th century by the Fitzgerald family, had been extended to the front by Pugin, at the invitation of the Earl of Kenmare. At the time, Pugin was working on Saint Mary’s Cathedral, and his work at Woodford House includes a Gothic-style window inserted above the stairs in the original house, and a Gothic-revival, three-bay facade added to the front of the house. The foundation stone for Saint Aidan’s Cathedral, Enniscorthy, Co Wexford, was laid in 1843. This is Pugin’s largest church in Ireland, and local people in Enniscorthy describe it as ‘Pugin’s gem.’ Once again, Richard Pierce was Pugin’s clerk of works. The external stonework is superb work by the Irish stonemasons who were praised by Pugin. Renovations in 1996 did much to restore the original beautiful building as envisaged by Pugin. The restored stencilling of the interior gives us some idea of what Pugin wanted for his churches. While he was engaged in designing Saint Aidan’s Cathedral, Enniscorthy, Pugin also designed this Co Wexford church. Once again, this church was designed by Pugin through the patronage of John Hyacinth Talbot. Saint Mary’s contains more original Pugin features than any of his other Irish churches, including floor tiles in the large sanctuary area produced by Henry Minton (1795-1858), wooden screens to the side chapels, stained glass by Hardman, a set of four brass altar candlesticks designed by Hardman and presented by Pugin when the church was dedicated in 1846, and a marble, brass-inlaid memorial floor slab in the sanctuary commemorating Canon Rowe, presented by Sir Thomas Esmonde, Pugin’s patron in Gorey. Saint Alphonsus’s Church, Barntown, near Taghmon and in the parish of Glynn, was built on 1844-1848. It was planned by Pugin as a complete Catholic parish church, so it consists of a nave and aisles with a belfry, south porch, wide passages for processions, a distinct and deep chancel, a sacristy, a Lady Chapel, and so on. Pugin’s design for Barntown is based on Saint Michael’s, one of two mediaeval parish churches in the village of Longstanton, 10 km north-west of Cambridge. Sadly, the church has been much altered, but the external stonework and the solid nature of the church is striking. The finest feature of the interior is the surviving Hardman high window. Adare Manor was built for the 2nd Earl of Dunraven ca 1846-1847, and incorporated some of Pugin’s designs for alterations and extensions to the existing house. Pugin’s contributions to Adare Manor are difficult to date and to quantify: Phoebe Stanton says he may have designed details in the great hall, various fireplaces and the general design of the dining hall. Pugin was commissioned by the 5th Viscount Midleton to design two villas or houses on his estate in Queenstown (Cobh), Co Cork, but, as Rosemary Hill points out, they were probably never built. Pugin designed the collegiate buildings of Saint Patrick and Saint Mary in Saint Patrick’s College, Maynooth, but not, despite popular perceptions, the college chapel. His original plans for Maynooth included both a chapel and an aula maxima or great hall, neither of which was built because of financial constraints. The college chapel, added later in 1875, was designed by a follower of Pugin, the Irish architect JJ McCarthy. This convent was commissioned by Sister Anastasia Beckett, and the foundation stone for his convent in Birr was laid in 1846, although the first portions were not built until 1847. The design is a heavy, stone version of the convents he had built in Handsworth and Liverpool. But Pugin also paid tribute to Irish architectural heritage by attaching a Round Tower to the corner of the building. The convent was still not complete when Pugin died in 1852. The main front resembles his design, but the larger part of the building was finally completed with slightly different massings by his son, EW Pugin, and his son-in-law, George Ashlin. The Pugin-designed convent chapel was greatly revised at a later stage. When the convent closed, the altars and the furnishings were donated to neighbouring churches or auctioned off. But the convent and chapel have been converted to accommodate a modern library, council offices and a health centre, and many of the original Pugin features have been carefully preserved or restored. Pugin designed some furniture for the sixth Duke of Devonshire at Lismore Castle, Co Waterford, although he never actually visited Lismore. This is not noted by either Hill or Stanton. The chapel at Edermine House, Co Wexford, was commissioned by Sir James Power and his wife, Jane, and was built in the 1850s. Jane Power was a daughter of Pugin’s Irish patron, John Hyacinth Talbot, and the Power family later intermarried with the Cliffe family of Bellvue. A plaque on the door and a second inside the chapel have led many to believe that the chapel is too late to have been designed by AWN Pugin, and they have ascribed it to either his son, Edward Welby Pugin, or to JJ McCarthy. However, Pat Doyle, the present owner of Edermine House, has long believed that the chapel is an original work by Pugin and that McCarthy merely supervised its later construction. Many contemporary writers believe the intermarriages between the Talbot and Power families underpin the supposition that the chapel was originally designed by the elder Pugin and that the project was supervised either by his son or by McCarthy. Although the College Chapel in Maynooth is often ascribed to Pugin, this is the work of JJ McCarthy, designed by him a quarter century after the death of Pugin. Phoebe Stanton says Pugin added a new roof and stained glass windows ‘to the village church [in Adare], which he probably also full restored.’ But she does not say which church. Rosemary Hill does not refer to this at all. 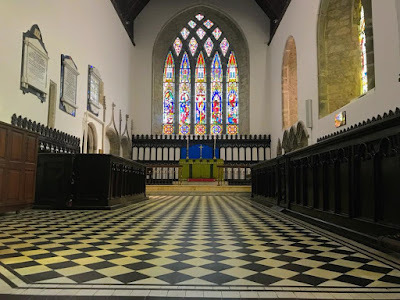 Although Pugin’s influence can be seen everywhere in the Trinitarian Church in Adare, I would suggest this is Saint Nicholas’s Church, with its collegiate east end and the large number of Hardman windows in the church. The Midleton Arms, a public house and shop on the Midleton estate, Co Cork, have also been attributed to Pugin. But they date from 1861, and, if anything, may have been the work of his son, Edward Welby Pugin. A church in Portarlington, Co Laois (Hill moves this to Co Offaly) is also attributed to Pugin, and dates from 1845. Although it may have been built according to Pugin’s plans for another church, I am still wondering whether it can be ascribed to Pugin. The Cliffe family stirred controversy in Co Wexford when they changed their membership from the Church of Ireland, becoming Roman Catholics in 1856. They built a new chapel adjacent to their home at Bellvue in 1858-1860, and although the chapel was designed by JJ McCarthy, he used earlier plans by Pugin. Apart from some, unidentified, work at Adare Manor, and some unspecified work at Saint Nicholas Church, Adare, there are no works by Pugin in Co Wexford. His sons Edward Welby Pugin and Peter Paul Pugin continued his architectural firm as Pugin & Pugin. His son-in-law, George Coppinger Ashlin, continued this tradition in the practice of Ashlin and Coleman. 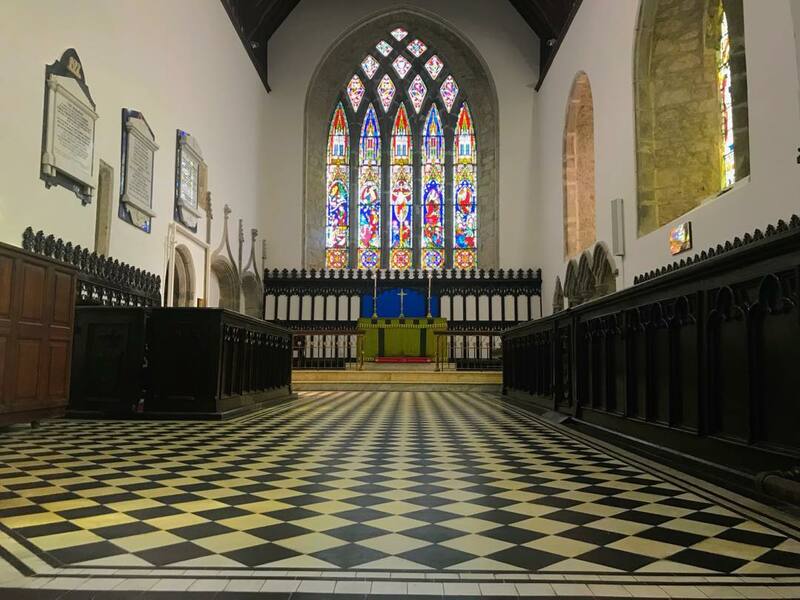 The influence of the Gothic Revival can be seen in Co Limerick not only in the works of the Pain brothers and the Fogerty family, but in churches and church buildings throughout this city and county. JJ McCarthy, who claimed Pugin’s mantle, was the architect of many of these churches, including Foynes, Kilmallock and Rathkeale. But his work might be a topic for another evening. (Revd Canon Professor) Patrick Comerford is priest-in-charge of the Rathkeale Group of Parishes, Precentor of Saint Mary’s Cathedral, Limerick, and a former theology professor in the Church of Ireland Theological Institute and Trinity College Dublin. 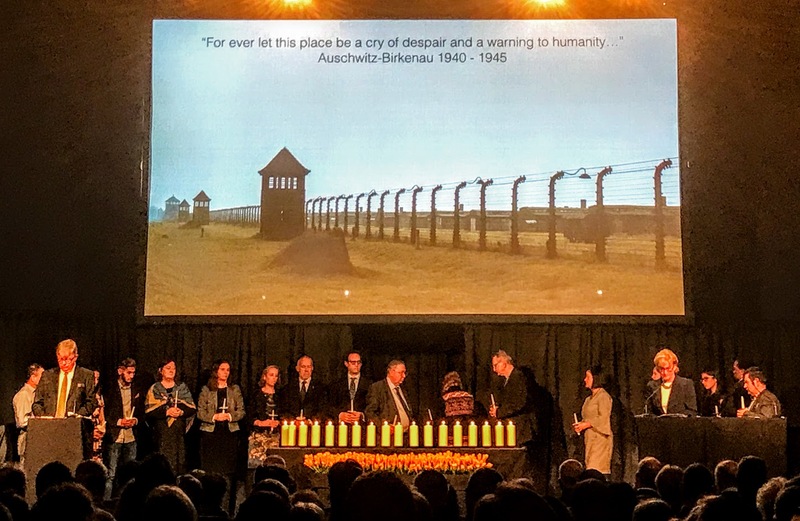 I was a guest at the Holocaust Memorial Day commemorations in the Mansion House in Dublin last night [27 January 2019]. Other speakers in the Round Room in the Mansion House last night included Holocaust survivors Suzi Diamond, Tomi Reichental and Walter Sekules, who live in Ireland, as well as Jadzia Kaminska, who represented her father Jan Kaminski. Holocaust Memorial Day commemorates the memory of all who dies in the Holocaust. It recalls six million Jewish men, women and children and millions of others who were persecuted and murdered by the Nazis because of their ethnicity, disability, sexual orientation, political affiliations or religious beliefs. 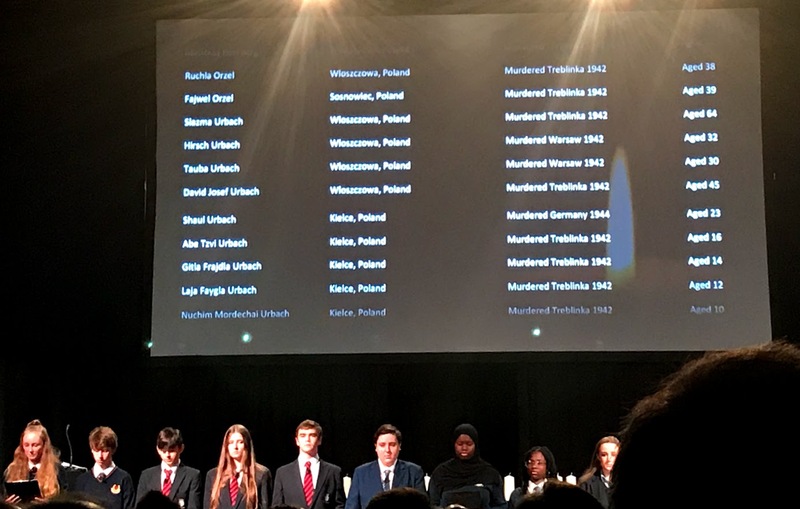 Last night’s ceremony included readings, survivors’ recollections, candle-lighting and music, and Dr David Jackson who spoke last night revealed how his new research shows there were at least three Irish-born victims of the Holocaust. 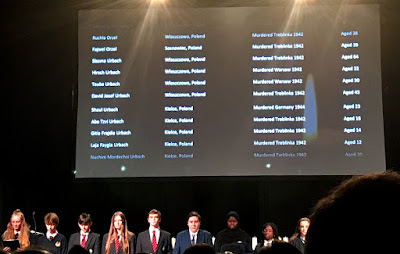 During my visit to Auschwitz at the end of 2017, I noted that there is no plaque to least two Irish citizens who died in Auschwitz – Ettie Steinberg and her son Leon. Until now, Esther Steinberg was the only Jewish person from Ireland known to have died in the Holocaust. The historian Conan Kennedy has researched the story of this mother and her child, and more recently her story has become the subject of a new play, Ode to Ettie Steinberg, by Deirdre Kinahan. The story begins in the former Czechoslovakia, where Ettie was one of the seven children of Aaron Hirsh Steinberg and his wife Bertha Roth. Last night, Dr David Jackson, spoke of his research that shows how Isaac Shishi, Ephraim Saks and his sister Lena Saks, were all born in Ireland, but their families returned to Europe when they were children. Isaac Shishi’s family came from Lithuania to Ireland in 1890, and he was born in Dublin on 29 January 1891, when his family was living at 36 St Alban’s Road, off the South Circular Road. He was murdered along with his wife Chana and their daughter Sheine were murdered by the Nazis in Vieksniai in Lithuania in 1941. Ephrem and Lena Saks were born in Dublin on 19 April 1915 and 2 February 1918. Ephraim was murdered in Auschwitz on 24 August 1942. Lena was murdered there in 1942 or 1943. Last night’s programme also paid tribute to Dublin-born Max Levitas, who died last November at the age of 103. His parents were Jewish immigrants to Dublin, fleeing anti-Semitism in the Tsarist Russian Empire. Harry (Hillel) Levitas and Leah were married in 1914 in a synagogue at 52 Lower Camden Street, now the Dublin offices of Concern Worldwide. The eldest of six siblings, Max Samuel Levitas – Motl Shmuel ben Hillel – was born in June 1915 at 15 Longwood Avenue off the South Circular Road, in the Portobello area of Dublin, then known as ‘Little Jerusalem.’ The family attended Lennox Street synagogue, just around the corner. Max took part in the Battle of Cable Street in the East End of London in October 1936, while his brother Maurice was a volunteer in the International Brigade in the Spanish Civil War. Max’s last public speech, at the age of 101, was at commemorations in October 2016 marking the 80th anniversary of the Battle of Cable Street. Until he died, he had been a frequent visitor to his native Dublin, and regularly attended the Holocaust Memorial Day ceremonies. Max had many family members to remember: his aunt Rachel died with most of her family in Riga, his father’s sister Sara died in Akmeyan, and his uncle Elie Leyb Levitetz, was a victim of the war in Paris.